Win a free place on our next Learn to Rock Climb Course in the Gap of Dunloe, Kerry! We've two free places to give away for Sat 17th & Sun 18th July. The emphasis of this fun and exciting two-day rock climbing course is to get onto sandstone cliffs and climb as much as possible. You will learn to use climbing equipment, tie knots, climbing techniques, abseiling and belaying. At the end of this course you will be climbing competently and know the basics of climbing. Equipment and qualified instructors are provided. When a climber leads a new climb, that has never been climbed before, they get to name it whatever they want. The name the climber gives it becomes the official name of the climb from then on. If you got to name a rock climb in the Gap of Dunloe, what would you call it? Leave a comment below, along with your email address, and we'll choose the best two names on Tues 15th June. You can enter up to three times, so get your imagination working! Any questions on our competition, just leave a comment below and we'll get back to you. Climb Ireland's classic mountain scramble, the spectacular and breathtaking Howling Ridge! This is a two-day course, based in the MacGillycuddy Reeks. You will spend the first day learning, or improving, scrambling technique, rope work and communication, on easier rocky ridges. You will then spend the second day undertaking a roped ascent of Howling Ridge, high on the north-east face of Carrauntoohil. The second day is both weather and ability dependant, as good conditions are needed to safely climb this route. On Saturday, in Caherdaniel, I had a very disappointing experience with the Blind Piper Pub. It wasn't a massively big deal, but enough to leave the group of eight of us with a very negative experience. The ironic thing is that on Saturday morning, on a kayak trip on the Lakes of Killarney, I'd recommended to a couple that they stop at the Blind Piper Pub for lunch as they toured the Ring of Kerry. Just a few hours later a group of eight of us had planned to meet for dinner and a few drinks at the Blind Piper. I dropped into the pub at 810pm to enquire what time they stopped serving food and two stony-faced staff informed me 830pm was food finish time. Fair enough - nothing wrong with that, although they could have smiled! I then explained that there were a group of eight of us arriving shortly and if we were a few mins late, would that be OK? I was given a curt 'no' by one of the staff, while the second staff member's exact words were 'if you're here after half eight, tough sh*t'. Having got everyone together, we walked back into the pub sometime between 830pm and 832pm (potentially two mins late). We were then, fairly rudely, told that they had finished serving food for the evening; no smile, no apology, no explanation, no effort; despite the fact food was still being carried past us, to waiting diners. So we left, and had pretty good fish and chips in Caherdaniel's only other food place, a small fish and chip shop, with a really friendly, chatty girl behind the counter and an extremely helpful man, who came outside to us after we'd finished our meal to collect all our rubbish and take it inside. By turning us away, the Blind Piper lost out on approx €360 in total, between food and drinks for us all. More importantly however they have created eight unhappy customers, because of a simple lack of the most basic customer care and politeness policies; because of the fact that a staff member felt the need to say 'if you're here after half eight, tough sh*t'; and because of the response we were treated to when we turned up to order food, potentially a whole two mins late. While I'm sure none of us will be ringing Joe Duffy's Live Line, the Blind Piper has just created eight unhappy and disappointed people, several of whom work in the tourism industry, and I doubt any of us will be giving raving recommendations about the place in the future, or sending people to eat and drink there. It's more their rudeness, than their inflexibility, that's annoying me. Hopefully this was a once off instance. Isn't it lucky it didn't happen to visiting tourists, searching for the infamous Irish welcome? Most days of the week I see tourism/hospitality businesses striving to deliver excellent and genuine customer experience. I see Failte Ireland's message of 'Come to Ireland, experience the true Irish welcome'. I exchange emails and stand at trade shows, talking to potential visitors, promising the craic and genuine, friendly, welcome they'll experience... It's all true and it's all here, waiting to be experienced, I believe that 100%. Every now and then however, somewhere slips through the net and delivers something bitterly disappointing and un-Irish. The problem with places like the Blind Piper, on Saturday evening, is no-one can really hold them accountable, no-one will probably make a fuss, they've no immediate local competition to up the ante of what they deliver. Visitors will return to their homes, possibly that little bit less enthusiastic about their trip, or that little bit less likely to return to Kerry. Surely now, more than ever, excellent customer service, giving that little bit extra service and a friendly smile is more important to Kerry than ever? I'm putting together a blog this week about team issues and common problems that crop up within a typical team environment. I'd really like to hear what you think the common team issues and problems are, that you deal with? On Sunday 25th July we're running a Map Reading & Compass Work Day in the Wicklow Mountains. Learn how to read a map, or improve your map reading skills; take compass bearings and follow them across open hillside; discuss personal and safety equipment and meet other like-minded people! Discover the Lakes of Killarney by moonlight, as you use the full moon to kayak along dark wooded shores and among silent islands. Explore the limestone caves from your kayak by torch light. Land on the ancient, mystic ruins of Innisfallen Abbey and savor the breathtaking sight of Ross Castle illuminated by moonlight. Want to learn to kayak, thinking of buying a canoe, or just want to improve your skills? Learn the skills to paddle your own kayak or canoe, with different strokes, techniques and rescues, plus what to do in emergencies. FITT Ladies Bootcamp have offered us two places (value €150) to give away for any ladies looking to get fit for the summer! If you don’t like the gym environment FITT Ladies Bootcamp workouts are outside during the summer and weekends; we relish the fresh air and freedom all summer, then take it indoors for the winter. We are female trainers who know what women like and don't like doing for exercise. Simple! You will get the same results as having a personal trainer without the cost! Some comments over the past months from people on our adventure trips and training courses. Thanks a million guys and hopefully I'll see you over the coming summer or autumn! I had a really great weekend, full of activities and great fun. I went on my own, which made it easier to mix with the group and meet lots of nice people, even some cute guys. We were really lucky and had amazing weather, Killarney looked fantastic. I'd recommend it to any single people who want a great weekend away that's a bit different. Thanks for organising the glacier travel/ crevasse rescue course for us. It was excellent from start to finish, weather withstanding. Dave is an excellent instructor and was very knowledgeable in the area and yet very down to earth. I cannot recommend him enough. Firstly, I had such a magical and wonderful time and I thank you sincerely. To feel the snow falling on my face and to see the sun shining over Killarney was only beautiful. The image will be with me forever. I felt like I was on holidays.... in Costa del Kerry! For a first time, I was a bit nervous (and slightly afraid of heights), but straight away the lads from Outdoors Ireland put my mind at ease. We were shown how to put on the equipment correctly and introduced to the task at hand. The rock face proved to be hard but I was delighted when I got higher than I thought I would. The group was small enough that we had time to retry each of the climbs. It was an excellent experience. I will definitely do it again. Fastnet Rock from Outdoors Ireland on Vimeo. Together with Darragh, I'm working to compile some of the history and stories involved in some of the guided trips we run throughout Killarney National Park and the MacGillycuddy Reeks. Here's an initial, rough working draft, which I thought may be of interest. If you know more to any of these, or know of any other good stories and local history, please leave a comment on the bottom of this blog. I'd love to hear it! 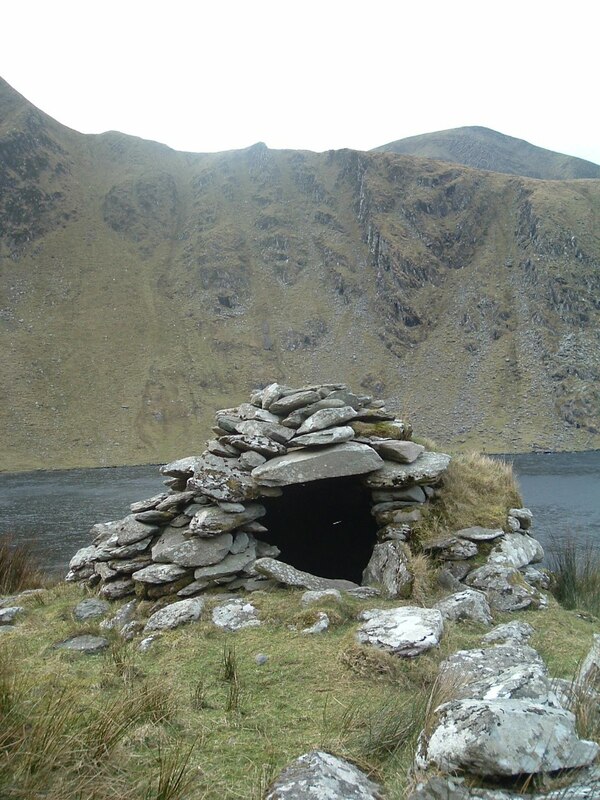 Hag's Glen, tucked under Carrauntoohil, is named after an ancient wise woman, or 'Cailleach', who dwelt here many centuries ago. Hugely respected, in a time of myth and magic, people went to her searching advice and medicines. She lived on an tiny island on Loch Caili, assessable only be boat or underwater stepping stones. Caher is named after an ancient watch tower which once stood on this mighty peak, during the time of the Fianna. From here warriors could stand guard over West Kerry and see approaching attackers far away. They often kept a goat in the watch tower and if attackers were spotted they would cut the goat's throat and allow the fresh blood to flow down the stream into the village below, quietly warning the villagers and warriors of an approaching attack. Thus the village was prepared with an ambush once the invaders arrived. The saddle at the top of the Devil's Ladder is know as Christ's Saddle and is thought to be a pagan burial site of an important wise man or chieftain. In the Gap of Dunloe, less than ten years ago several muskets were found, wrapped in a cloth. These guns dated back to the 1920's and would have been used during the War of Independence or Irish Civil War. The Gap of Dunloe was a dangerous place for British troops moving through it, often being attacked by local Irish soldiers, who took advantage of the steep, high ground and excellent cover. There's actually a large rock part-way through the valley, called Turnpike Rock, where several British soldiers were ambushed once. 15th century Ross Castle was built by local chieftain O Donoghue Ross, who died in later life after having made a pact with the devil, for everlasting life; which went tragically wrong. He leaped from the upper castle window into the lake to his death and it's told that he walks upon the lake on certain nights still. Ross Castle was the last, or one of the last, Irish strongholds to fall to the British. It eventually fell in the 16oo's, having been taken from the water. Large, flat bottomed, boats were floated across the lake to underneath the castle. Once the defenders saw these boats and artillery at such close range they surrendered, as ancient legend foresaw. Innisfallen Abbey was built in the 6th century and was originally used as a leper colony, being one of the last leper sites in Europe. It then became a place of learning, with nobles from all over Europe travelling here to learn. Many of the Irish high kings were also sent here to be educated, including Brian Boru. It's on this little island that the Annals of Innisfallen were written; now kept in a museum in Oxford. Three times the Vikings attacked this abbey, plundering for gold and valuables; each time one of the monks was sent to hide with the valuable belongings in one of the near-by limestone caves. Maria Mullarkey, from Nationwide, was down in Killarney with us last Friday. She was doing a piece on one of our typical Single Adventure Weekends, which we run based at Randles Court Hotel. The piece should be aired in May sometime, I'll keep you posted! Thanks to everyone who took part in the day. There were plenty of people wanting to be put in touch with each other after the day, so who knows what may happen!? Our next Singles Adventure Weekend is running on Sat 26th & Sun 27th June.